Looking for Waterfront Property on Lake Winnipesaukee by Boat? 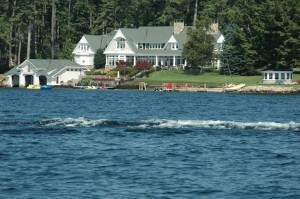 Lets face it, the way to see a beautiful waterfront property on Lake Winnipesaukee is by boat. Approaching a waterfront home from the lakeside provides one with a view of the front and not the back of the house, the dock, waterfront amenities and the shoreline. You are ultimately going to invest a lot of money in the purchase of waterfront real estate so experiencing the property from the waterside not only makes sense but its also fun! As Realtors at Maxfield Real Estate in Wolfeboro, we felt the need to give our Lake Winnipesaukee waterfront buyers a unique buying experience. 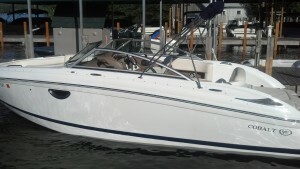 What better experience than going out on our Cobalt 242 bow rider. This boat is the perfect size to travel the lake in comfort and safety. It is equipped with a head and is large enough to comfortably seat eight without even using the bow area. 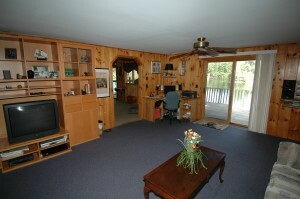 We also now have the ability to show our buyers the many island properties for sale on Winnipesaukee. The excitement of seeing a Lake Winnipesaukee waterfront property by boat that may become yours is an experience not to be missed! Our waterfront sellers also benefit from our ability to arrive by boat to their property because we are able to video and photograph their property from this perspective. Because 95% of buyers come through the internet, it is critically important that the photos are the very best photos that we can provide to our clients. Marketing their properties effectively, which includes photos from the water only enhances the chance for their property to be seen, shown and sold. So if you too want to explore Lake Winnipesaukee real estate in our wonderful boat between the 1st of May and mid-October, please contact us. Who knows, you may just see a property for sale on the lake that you didnt realize was available but is something you just have to see. One of the exciting things about being a Realtor is when you have the opportunity to list and promote a very unique property. Every property has characteristics that make it unique, but it is the rare property that epitomizes what the term unique stands for in real estate. We have just listed such a property, historic "Stonehenge of Wolfeboro located in the Oldest Summer Resort in America. This summer home was built in 1907 by Isaac F. Baker as a private retreat by the shores of Lake Winnipesaukee. The home was named after the famous prehistoric observatory Stonehenge located in the English county of Wiltshire. When originally built in 1907, Stonehenge of Wolfeboro had a 360 degree view of the countryside which included South Wolfeboro Bay on Lake Winnipesaukee. The massive stone columns surrounding the house and the stone steps into the Great Room speak of a time gone by. This important property encompasses 26.9 acres with 3 lots of record including a separate 3.2 acre lot with 400 feet of shore frontage on South Wolfeboro Bay. This important property encompasses 26.9 acres with 3 lots of record including a separate 3.2 acre lot with 400 feet of shore frontage on South Wolfeboro Bay. Stonehenge has 7 bedrooms and was authentically restored by the present owners who recently added a tennis court, 3 pitch and putt greens, bocce, volleyball, basketball and badminton courts plus several miles of trails. Step back in time as you arrive at the estate via a long winding drive to the elegant stone entry leading to a covered wraparound porch. Upon entering the Great Room of this splendid home admire the soaring two story fieldstone fireplace. Equally impressive are the natural bead board walls and original hardwood and pine floors, as well as the large formal dining room and updated kitchen. For outdoor gatherings, there is a second kitchen for catering on the lower walk-out level. The original 1907 stone garage will house two cars with a storage room above. Theres the opportunity to build up to two more homes on the extra 2 lots of record, with one home being by the lake and one by Mink Brook. Whether it remains as is or becomes a family compound, this stunning property is one of a kind and for the discerning buyer. Contact Steve and Carol Bush of Maxfield Real Estate for more information or to make an appointment to view this important property. 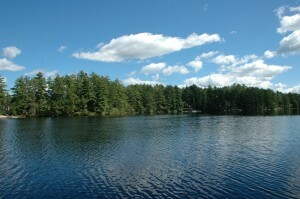 Here is a rare and affordable opportunity to own a 3 bedroom year round island home on beautiful and peaceful Balch Lake in Wakefield, New Hampshire with a land bridge and 300 feet on the water. There is a separate heated guest cottage, plus a large workshop/studio over a 2 car garage. 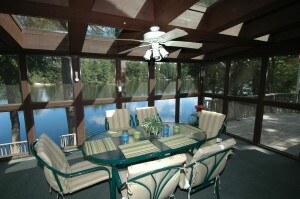 The house is situated close to the water with two decks, a spacious screened porch and a walkout basement. The house easily sleeps up to 10 or more people, and both the house and guest cottage feature warm pine paneling. There is a new 30 year shingled roof. One of the unique features is the private boat ramp as well as ample storage for your boats, vehicles or equipment under the guest cottage. Come see this wonderful waterfront property that will give you, your family and friends many years of enjoyment. It is listed at $399,900 which is below assessment. For further information and a virtual tour, click HERE. Take the opportunity to tour this property and imagine how living here could change your life in so many wonderful ways. Contact Steve or Carol Bush today for more information or to schedule a showing. Can You Imagine Living Here on Lake Winnipesaukee? 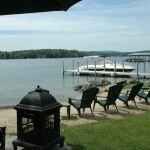 This Wolfeboro Luxury Waterfront Wont Last Long! Now on the market is one of Wolfeboro New Hampshires finest luxury waterfront homes. This is the luxury home you always dreamed of owning. This beautiful Lake Winnipesaukee house has just had a complete makeover. Placed on a new foundation and taken right down to the studs, everything is brand new inside and out. The only remaining clue to its former life is the lovely fir floors salvaged in the process. Designed by an architect, the interior has 3 levels of luxurious living space including a top of the line kitchen, 3 spacious bedrooms each with a private bath, a lakeside living room with a gas fireplace and a huge family room. Located on highly sought after South Wolfeboro Bay Lake Winnipesaukee, the property offers preferred southern exposure, gorgeous views, a level landscaped lot with sweeping lawn, a sandy beach and 40 foot dock for 2 boats ... a picture perfect setting for this quality built home! Literally just minutes from Huggins Hospital, Kingswood Golf Course, downtown Wolfeboro and all the dining and shopping you can handle, this is the location and the house which offers a discerning buyer the opportunity to own one of the finest waterfront properties in Wolfeboro, New Hampshire. This beautiful home must be seen to be appreciated! Contact Steve and Carol Bush today at 603.455.7428 or 603.387.4733 to view this outstanding home and property or to get more information. Lake Winnipesaukee in Central New Hampshire has been the playground for many a child since the late 19th century, with camps of all kinds and affiliations catering to the desires of children from all over the world. 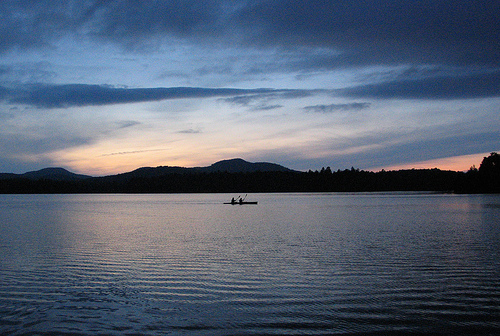 No matter what your childs interests, horses, music, water sports, hiking and camping, there is a camp somewhere on Winnipesaukee for them to enjoy. Heres just a sampling of whats available: Camp Robindel for Girls in Moultonborough, YMCA Camp Belknap in Tuftoboro, Camp Tecumseh in Moultonborough, North Woods Camp for Boys in Tuftonboro, and Camp Winaukee for Boys in Moultonborough.